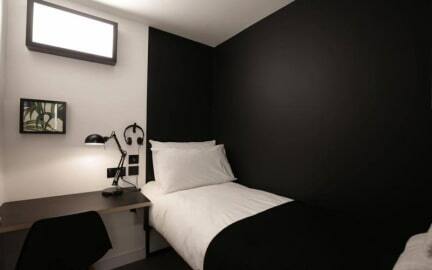 Kip Hotel i London, England : Boka nu! Amendments are subject to charges for any rate difference. This is of course subject to availability but we will try our best to accommodate. Cancellations out of the 14 days policy will not be refunded. This policy applies when booking more than 5 rooms or pods. Please note that this cancellation policy does not apply when booking more than 15 rooms. If booking more than 15 rooms please contact the hotel directly for more information on the terms and conditions. All bookings are secured with a valid credit card number at the time of booking. Full payment for the group booking will be taken 14 days prior to the arrival date on the credit card provided at the time of booking. Kip is on a mission to bring the world style and service without the silly price tags. So do yourself a favour, and next time you’re in town #GetSomeKip. Come see us at our brand new Hackney Central location. We need good kip like we need food, water and free wi-fi, but we don’t think that a stylish, comfortable hotel bed should cost the earth. 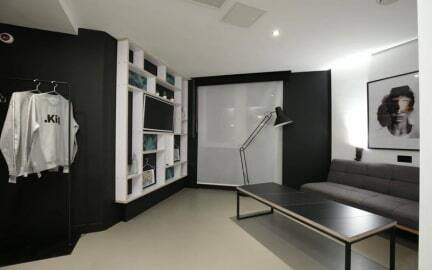 That’s why we came up with the Kip concept – hand-crafted, monochrome interiors, and a range of accommodation to suit every need, from live/work accommodation through to holiday-makers and families, couples, groups and singles, out-of-towners and London locals. Located In Hackney next to Hackney Central Station the hotel is perfectly situated with great access to the London Travel network. Whether your in London to see the sights or for work, Hackney is the perfect location to base yourself with excellent access to transport and the city. Kip provides a wide range of room types from Pods and Cabin rooms with shared facilities to our large group rooms with en-suites for 6 and 8 people. Kip also provides all of it's guests with free high speed internet. For standard reservations: Kip will take the full amount of your stay within 48 hours of your arrival date, this amount is non-refundable in case of a no-show or late cancellation. For advance purchase reservations: This reservation requires full pre-payment and is non-amendable and non-refundable. We will charge the full amount of the reservation to the credit card used to make this reservation shortly after the reservation has been made. For group reservations: This policy applies to bookings for KipFriends group rooms (rooms with capacity for 6+ guests) and/or single reservations for 5 or more rooms. All bookings must be secured with a valid credit card number at the time of booking. Full payment for group bookings will be taken 14 days prior to the arrival date. Once taken this payment is fully non-refundable. If you need to change or cancel a reservation this must be in writing. Cancellation policy for New Year's Eve(31.12.2017) is 7 days before arrival. You MUST present the card used for the booking upon arrival. If this is not possible and the card used for the reservation does not belong to the guest, a third party form must be requested directly from the hotel (email: hello@getsomekip.com or tel: +44 20 8629 7884) and completed prior to the arrival date. Failure to do so may result in the guest not being allowed to check in. We have 24 hour Reception. You can only make a booking if you are 18 years old or over. If you arrive at the hotel and are under 18 years of age you will not be permitted to stay alone.